You tell me, dear friend, that the hitherto rendered reviews of Don Carlos have brought you little satisfaction, and you hold that the greater amount of them have failed to consider the actual point-of-view of the author. You consider it still possible to save certain daring passages that the critics considered unsupportable; some doubts, that have, however, been raised, you find, in the context of the play--wherever not fully answered, nevertheless foreseen and brought up for consideration. With most of the doubts, you say, one can far less admire the sagacity of the reviewers than their self- satisfaction with which they present those doubts as great discoveries, without being bothered by the most natural thought that transgressions (in the play), that must be obvious to the most idiotic observer, would very well have been obvious to the author who, among his readers, is seldom the least informed, and that we are dealing here far less with the subject matter itself than with the reasons that motivated him. Those reasons can, admittedly, be weak and/or unsupportable, can be based on a one-sided view of the subject matter: it would have been the task of the reviewer, however, to show any such weaknesses, or any such one-sidedness, would he want to gain the attention of him of whom he wants to present himself as a judge of or offer himself as counsel to. However, dear friend, why should the author be concerned, in the end, as to whether his critic was competent or not? How much or how little insight he has shown? May the critic be his own judge in that. It would be detrimental for the author and his work, were he to rely for the impact of his work on the gift of divination and fairness of his critics, if he would make the impression of his work dependent on qualities that are concentrated in a few heads only. It is one of the most deplorable states for a work of art when it is subjected to the opinion of its viewer and of the interpretation that viewer wants to render of it, and when help is needed to enable the viewer to start judging the work from the right point of departure. In case you wanted to give me a hint that my work finds itself in such a state, then you have said something terrible about it, and you cause me to judge it again more thoroughly from this point of view. It would, so it appears to me, be most important to investigate if everything is contained in the play that aids to its understanding, and if it has been presented with such clarity that it was easy for the reader to understand it. Thus, indulge me, if I now entertain you, dear friend, in this manner for a while, with this subject. The play has become more unfamiliar to me, I now find myself, so-to-say, between the artist and the viewer/reader, which might allow me to use the familiarity of the former (with the play) to view his subject with the 'unwashed' eyes of the latter. It may have been the case--and I find it necessary to mention this beforehand--it may have been the case that I have raised different expectations in the first three acts than those that I fulfilled in the last acts. St. Real's novel and perhaps also what I wrote about that in the first issue of the 'Thalia', may have presented to the reader a point of view of that matter from which the play cannot be considered anymore, today. During the time, namely, in which I outlined and first worked on the play, which was--due to many interruptions--a very long time, many changes have taken place in my innermost. By the many fortunes and misfortunes that have shaped my thinking and feeling during that time, the play had, necessarily also to be shaped. What had initially fascinated me about the subject (of the play), grew less and less important to me and, in the end, lost its hold over me entirely. New ideas that came, indeed, to the fore in me, replaced the former ones: Carlos had lost my sympathies, perhaps due to no other reason that I had outgrown him too much in years, and due to the opposite reason, Marquis Posa had taken his place. Thus it came about that I approached the fourth and fifth acts with quite another mind. The first three acts, however, were already in the hand of the public, the overall design of the play could not be changed, anymore--I would have had to suppress the play altogether (which the lesser part of my readers would have thanked me for), or I had to adjust the tenor of the second half of the play as well as I could to that of the first part. If that did not turn out most favorably everywhere (in the play), I am still consoled by the fact or possibility that even a more skillful writer than I am would not have had better luck with it. The main problem was that I had worked on the play for too long; a dramatic work, however, should be the fruit of one single summer. The plan for this play had been designed too widely, as well, if one considers the limitations and rules of a dramatic work. This plan, for example, required that the Marquis had to win the unmitigated confidence of King Phillip II; the economy of the play, however, allowed me only one single scene to accomplish that. My friend will, perhaps, find these explanations sufficient, but (the demands of) art, I am afraid, will not be satisfied by them. May these explanations, however, put to rest the many criticisms that have been raised against me from this point of view. By and large, the character of Marquis de Posa has been found to be too idealistic; to what extent this statement is well founded will best be seen then when one has tested the peculiar actions of this man as to their true meaning. I am dealing here, as you see, with two different, opposing factions. Those who want to see him simply removed from the class of natural human beings should be shown to what extent he and his actions are part of general human nature, to what extent his opinions and his actions flow from very human motivations and are embedded in the entanglement of outer circumstances; those who wish to give him the name of a godly person I only have to show some of his shortcomings that are all-too-human. The opinions that the Marquis holds and utters, the philosophy that guides him, the favorite thoughts that he cherishes, as much as these are elevated above everyday life, can, seen as mere ideas and concepts, not be what has rightly removed him from the class of natural human beings. For, what can not find room in a human mind, and what brain child can not grow to a passion in a glowing heart? His actions cannot be the reason either, actions that, as seldom as they may have happened, have yet found their equivalent in history, and of which his personally sacrificing himself for his friend, has no or little advantage over the heroic sacrificial deaths of a Curtius, Regulus and others. The problem would thus have to lie in the contradiction between his opinions and those of his era or in their inability and lack of life in order to inspire him to such actions. I can, therefore, not understand the arguments against the naturalness of the Marqui de Posa's actions in any other way than that in King Phillip II's century no man was able to think as Marquis de Posa did,--that thoughts and ideas of this kind could not, as it happened here, be transformed so easily into action,--and that an idealistic yearning could not have been realized with such consequence, not with such energy transformed into action. Those arguments that are raised against de Posa from the context of the time into which I have him act thus would, in my opinion, speak rather for than against him. After the example of all great minds, he arises in a time of darkness and light, an extraordinary, isolated phenomenon. The time out of which he is born is a time of a general process of mental fermentation, a time in which prejudice fought with reason, a time of anarchy of opinions, of the dawn of truth--as ever a time of birth of extraordinary human beings. The ideas of freedom and nobility of the human mind, which a happy coincidence, perhaps a fruitful upbringing, allowed to grow in a receptive soul, make these ideas seem fresh and work through the power of their surprising newness; even the secrecy in which they may have been conveyed, elevate the impression of their strength. They have not yet been worn out by their trivial use that makes them appear so stale today; their great stamp of truth has not yet been corrupted by the prattling of scholars or by the wit of the worldly people. In these ideas, his soul might have felt like dwelling in a new and beautiful region, shining on him with a bright light and delighting him in a most beautiful dream. The misery of slavery and of superstition which is opposed to this dreamworld makes him feel drawn to it more and more; the most beautiful dreams of freedom are always dreamt in a dungeon. Tell me yourself, my friend--the most noble ideal of a human republic, general tolerance and freedom of conscience, where could these ideas have been born more easily and naturally than close to Phillip II and his inquisition? All principles and favorite ideals of the Marquis deal with republican virtue. Even his sacrificing himself for his friend proves this, for willingness to sacrifice oneself is the embodiment of all republican virtue. The time in which de Posa is placed was just the time in which, more than ever before, human rights and freedom of conscience, were talked about. The preceding reformation had first brought these ideas to the fore, and the unrest in Flanders kept them alive. His (the Marquis') outer independence, his status as a Maltese Knight, provided him the opportunity to let his speculative yearnings ripen. In the age and the state in which the Marquis lived and in the outer circumstances that surrounded it did not lie the reason why he could not have been capable of this philosphy, capable of harboring it with such devotion. When history is rich with examples of the fact that one can discard all earthly necessities and notions for opinions, that one can attribute strength to the most baseless delusions and that they can inspire humans to such a degree that they are willing to sacrifice everything for them, it would be peculiar, indeed, to think that truth could not inspire them in the same manner. At a time, in particular, that was so rich with examples that humans pledged their fortunes and their lives to follow ideals that, in themselves, were not very inspiring, it would seem to me that a character should not be found peculiar who sacrifices everything for the noblest of all ideas, unless one was of the opinion that truth would be less capable of inspiring humans than delusions. Moreover, the Marquis has been introduced as a hero. From his early youth on, he has proven himself to be courageous with the sword, a courage which he later reserves for more serious matters. Inspiring truths and uplifting philosophies should, it appears to me, transform the soul of a hero into something quite different than they would transform the soul of a scholar or of a tired, molly-coddled man of the world into. Predominantly two actions, so you tell me, are criticized in the Marquis: his behavior towards the King in the tenth scene of the third act and his sacrificing himself for his friend. However, it could be the case that the honesty with which he explains his opinions to the King is less based on his own courage than on his intimate knowledge of the latter's character, and with that personal danger to himself thus removed, the main argument against this scene would be dispelled. More about this some other time, when I entertain you with my thoughts on King Phillip II; for now I would only deal with the Marquis' sacrificing himself for the Prince, my thoughts on which I will discuss with you in my next letters. Lately, you claimed to have found evidence in Don Carlos that passionate friendship could be an equally moving topic for a tragey as passionate love, and my reply, that I wanted to reserve the painting of such a friendship for the future, surprised you. Thus you, as most of my readers, conclude that I had exalted friendship in mind in describing the relationship of Carlos and Marquis Posa? And from this vantage point you have thus viewed these two characters and perhaps the entire drama, so far? What if, dear friend, you had assumed too much of me in regard to this friendship? if it had been quite clear from the entire context (of the drama) that it was not my aim and actually could not have been it? If the Marquis' character, as it becomes apparent from the sum total of his actions, were not in harmony with such a friendship and if just from the evidence of his most noble actions, which one attributes to that friendship, one could provide proof to the contrary? The first indication of the relationship between the two might have been misleading; however, this misconception could only have developed superficially, and some astuteness and keenness of observation as to the different behavior of each could have sufficed to clear up this misconception. In the writer's referring to the friendship of their youth, he has not given up any of his higher intentions; to the contrary, these could not have been spun out of a better thread. The context in which both first appear on stage together was that of their reminiscing about their common study years. Harmony of feelings, a shared passion for the great and the beautiful, an equal enthusiasm for truth, freedom and virtue had tied them together in their past. A character such as that of Posa that unfolds as it later unfolds in the drama had to have begun early to practice these passionate emotions on a fruitful subject: a benevolence that would ultimately embrace all of mankind had to have had its roots in closer (personal) ties. This creative and fiery mind had to soon have found a subject on which he could work; could it have been offered to him and his outpourings in a more beautiful one than in a prince's son who had tender and lively feelings and who freely gravitated towards him? However, even already in these early days, the seriousness of his (Posa's) character becomes apparent in certain traits; already then de Posa is the colder friend of later days, and his heart, already then too all-embracing in order to 'pull itself together' for a single partner, had to be conquered by great sacrifice. Your proud heart returned them coldly. again as beggar, to beg love from you, etc. To be loved by Rodrigo." Already here it is hinted at the fact of how little the Marquis' friendship to the Prince was based on personal liking. From early on, he recognizes the son of a king in his friend, already then did this idea come between his heart and his pleading friend. Carlos opens his arms to him; the young citizen of the world kneels before him. Feelings for freedom and the nobility of mankind were ripe early on in his soul in his(de Posa's) friendship for Carlos; this branch was only later on planted onto the stronger tree. Even in the moment in which his pride has been conquered by the great sacrifice of his friend, he never loses sight of the king's son. "I will repay you," he says, "when you will be king." Is it possible that there still exists equality, in such a young heart, in the face of the constantly present awareness of the inequality of their social status? Thus even then it was less love than gratitude, less friendship than compassion, that won the Marquis for the Prince. The feelings, yearnings, dreams, resolutions that darkly and confusedly found their way into this boy's soul had to be shared, had to be reflected in another soul, and Carlos was the only one who was able to dream and yearn with him and who could share them. A mind such as that of de Posa had to strive to enjoy his superiority early on, and the loving Carlos clung to him so subserviently, so teachably! De Posa saw himself in this beautiful mirror and enjoyed his own reflection. This is how this school friendship developed. However, now they become separated and everything becomes different. Carlos returns to his father's court, and de Posa throws himself into the world. The former, early on 'spoiled' by his love for the noblest and fieriest young man cannot find anything at this despotic court to satisfy his (longing) heart. Everything around him is empty and unsatisfying. Lonely amongst so many courtiers, he feeds on sweet memories of the past. With him, these earlier impressions stay fresh and warm, and his heart which has been trained to benevolence and which is lacking a worthy subject, is eaten up by never satisfied dreams. Thus he gradually sinks into a state of idle revelling, passive contemplation. In his constant battle with his situation his strength gradually weakens, his unfriendly encounters with his father who is so little like him spread a sinister despair over his nature, the nagging worm of every spiritual striving, the death of enthusiasm. Crushed, without energy, without a useful occupation, brooding by himself, weakened by serious, yet fruitless battles, driven back and forth between frightening extremes, unable to lift himself out of this--thus he is found by his first love. In his situtation, he cannot put up any resistance to it; his mind has become a stranger to all those earlier ideas and ideals; it (his first love) rules over him with a despotic force; thus he sinks into a 'lusty' state of painful, yet 'enjoyable' suffering. All his strength is concentrated on one subject. A longing that has (and can) never be fulfilled holds his soul imprisoned within itself. How should it open up to the univese? Incapable of satisfying his longing, even less capable of conquering it by his own inner strength, he dwindles away half living, half dying: no relief from the burning pain in his bosom, no feeling heart that he could open up to. I can shed my tears." Now, helplessness and poverty of feeling lead him back to the very point at which fullness of heart had let him depart. Stronger he feels the need for sympathy because he is alone and unhappy. Thus his returning friend finds him. The latter had, in the meantime, had quite a different experience. With an open mind, with all his youthful strength, with the yearning of all of his genius, with all the warmth of his heart, thrown into the wide universe, he sees man acting in his immediate and in his greater environment; he finds opportunities to investigate the validity of his ideals in observing the actions of mankind at large. Everything that he hears and that he sees is devoured with lively enthusiasm by him and is thought and worked through from the viewpoint of bringing everything into relation to his ideal. Man shows himself to him in different varieties: in various areas, in various states of being, in various states of education and stages of happiness he gets to know man. Thus grows in him, in time, a comprised, noble impression of mankind in a greater and larger context, against which every narrower, smaller relationship vanishes. He steps outside of himself, in the world at large his soul spreads out to the farthest reaches. Some peculiar people who cross his path distract him and want to share his respect and love. To him, the individual is replaced by the entire species; a passing youthful infatuation widens into an all-encompassing philanthropy. An idle enthusiast has turned into an active man. Those former dreams and yearnings, which still lay dark and undeveloped in his soul had transformed into clear concepts, idle ideas had been transformed into action, a general, undefined striving to work had been transformed into purposeful action. 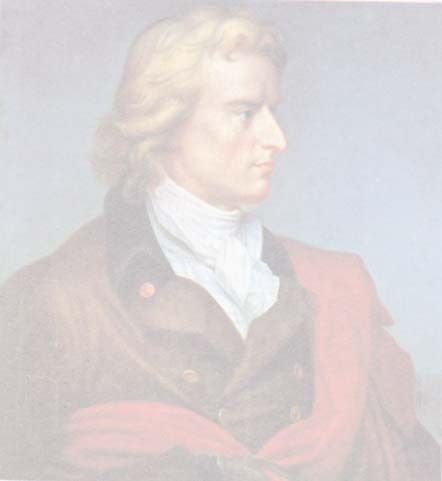 He studies the spririt of the nations, he weighs their strength and their means of supporting themselves; in his interaction with like-minded minds his ideas grow and gain in variety and form; proven men of the world such as a Wilhelm von Oranien, Coligny and others shape the romantic character of his ideas gradually into a practical usefulness. Enriched by thousand new, fruitful concepts, full of striving energy, of creative forces, of bold and far-reaching ideas, with a lively mind, a glowing heart, drenched with the great, inspiring ideas of general human power and of human nobility and with a desire to work towards the realization of the happiness of all mankind, that he saw present in so many great individuals*, he now comes back from his journey into the world, burning with the desire to find a place of action in which he can realize these ideals, in which to unfold his bountiful harvest. "and newly created is the world. Grant us freedom of thought! let great minds abound in your world. Return to mankind its lost nobility. as his brother's equally sacred rights. who is not a countryman, his crown. the creator of a more beautiful world. other than the limitation of his finite nature. The situation of Flanders offers itself to him. Here, he finds everything ready for a revolution. Familiar with the spirit, the strength and the resources of this nation, which he weighs against the power of its suppressor, he already sees the great deed as good as done. His ideal of republican freedom cannot find a more fitting moment, and a more receptive soil. "So many rich and prospering provinces! that, I thought, must be divine." The more wretched the condition of this nation is, the more the yearning grows in his heart, the more he rushes to fulfill it (his plan). Now, and only now he remembers vividly his friend whom he had left behind in Alcala, with a glowing passion for the happiness of mankind. Now he considers him as the savior of this oppressed nation, as the tool of his daring plans. Full of love that cannot be expressed since he connects him with the cause dearest to his heart, he hurries to Madrid into his arms, to find those seedlings of humanity and of heroic virtue that he had once planted into his soul, having ripened to full bloom, and to embrace in him the liberator of the Netherlands and the future creator of the ideal state, created by his own imagination. More passionate than ever, with a feverish intensity, the latter embraces him stormily. yours beat all-powerfully next to mine. lying at the bosom of my Rodrigo!" This is the most passionate reception: how does Posa answer it, however? He, who had left his friend when he was blossoming in his full youth and whom he finds now like a walking dead corpse, does he contemplate this sad transformation? Does he stop to fearfully probe into its reasons? Does he stoop down to the petty matters of his friend? Concerned and seriously, he replies to this unwanted reception. Provinces are crying on your shoulders." etc. A hopeless passion that devours all of his strength, that even endangers his very life. How would a concerned friend of the prince who would only have been his friend and not more than that, how would he have acted in this situation? And how did Posa, the man of the world, act? Posa, the friend and confidant of the prince, would have trembled far too much for the safety of his Carlos than that he would have dared to lend his hand in arranging a dangerous meeting with his queen. It would have been the friend's duty to think of the extinction of this passion and in no way whatsoever of its satisfaction. Posa, the defender of the cause of Flanders, acted quite differently. Nothing is more important to him than to as quickly as possible end the hopeless situation in which the strength of his friend is drained, even if this meant to run a risk. As long as his friend is brooding over his own unsatisfied wishes, he can not feel the suffering of others; as long as his strength is held down by his own depression, he cannot lift himself up to any heroic deed. Flanders has nothing to hope from the unhappy Carlos, but perhaps from the happy one. Thus he hurries to satisfy his dearest wish, he himself leads him to his queen; and he does not stop at that. He no longer finds in the Prince's frame of mind the motivation which would before have led him to heroic deeds; what else can he do but to set this burnt-out hero's mind on fire once more, but this time with another fire, with the fire of his passion, thus using the only passion that still dwells in his friend's bosom? To this passion he must tie the new ideas which he now wants to make his ruling ideas. Looking into the Queen's heart, he is convinced that he can expect everything from her cooperation. It is only the (Prince's) first enthusiasm that he wants to borrow from his passion (for his queen). Once it will have helped to awaken his friend's lively interest, this passion will no longer be needed and he can be sure that it will be destroyed by its own impact. Thus even this obstacle that stood in the way of his great cause, thus now even this unhappy love becomes transformed into a tool for his important purpose, and Flanders' fate has to speak to his friend through the mouth of his love. I soon recognized a golden ray of hope. out of the strength of this experience." Now, Carlos receives the letters Posa had brought for him from Flanders out of the hands of the Queen. The Queen calls back his escaped genius. The subordination of his friendship (for Carlos) under his ruling idea becomes even more evident at their meeting in the monastery. A design the Prince had on the King went awry. This and a discovery that he had made that was advantageous to his passion for the Queen pushes the Prince back ever more strongly into it, and Posa believes to have noticed that sensuality had entered the passion by now, as well. Nothing could be more contrary to his higher goals. All hopes that he had set on Carlos' love for the Queen would surely vanish should this love now sink to the level of sensual passion. His unhappiness regarding this discovery brings all his fears to the fore. all gone, swallowed up by one passion. ever since you love no-one but yourself!" Afraid of such a relapse in Carlos, he believes that he has to take a daring step. As long as Karl stays around the Queen, he is lost to the cause of Flanders. His presence in the Netherlands can bring about a turn of matters there; he does not hesitate for a moment to bring him there by the most cruel means. strengthened by the presence of a King's son." Would Carlos' friend have had the heart to play so daringly with the good name, nay, even with the life of his friend? Posa, however, to whom the liberation of a suppressed people was a far more urgent cause than the petty affairs of a friend, Posa, the citizen of the world, had to act in precisely this manner and not otherwise. All steps that are taken in this play show a daring courage that can only be inspired by a heroic purpose: friendship is often at wits end and always concerned for the object of its affection. Where, up to now, could be seen in the Marquis even a trace of this anxious behavior which is usually associated with the peculiar character of a passionate friendship? Where is his interest in the Prince not subordinate to his higher concern for mankind? Steadfastly, the Marquis follows his great cosmopolitan goals, and everything that happens around him only becomes important to him as it relates to his highest aspirations. This confession will have cost him the majority of his admirers; however, he will console himself with the small flock of new admirers that this confession sent his way. Moreover, a character such as his could never hope for overall approval. The lofty ideal of active striving for the well-being of one's fellow human beings in general would not necessarily exlcude one's tender concern for the joys and sufferings of individuals. That he loves mankind more than Karl does not prevent him from being his friend. Even if he (Karl) would not have been called by fate to be the heir to a throne, he (Posa) would always have reserved tender concern for him above all others; he would have carried his image in his heart of hearts, like Hamlet his Horatio. It is usually held that well-meaning becomes weaker and shallower the more it is directed towards various objects. This case, however, does not apply to the Marquis. The object of his love shows itself to him in the brightest light of his enthusiasm: beautiful and glorified, his image stands before his soul, like the image of a beloved woman. Since it is Carlos who is to realize his ideal of mankind's happiness, he transfers this ideal on to him, and ultimately the two become one in his feelings. Solely in Carlos he looks at mankind which he passionately loves: his friend is the focal point in which all of his concepts of the overall idea are concentrated. Thus, these come to life for him in one object which he embraces with all the enthusiasm and strength of his soul. I created a paradise for millions." Hence, here is evident his love of one object, while not losing sight of his love of mankind, careful nurturing of their friendship without any undue influence of the (usual) exclusiveness of such a passion. Here, there is a general, all-embracing philanthropy, focused on one burning point. Should that have harmed the interest which ennobled it? This painting of a friendship, should it have lost in grace and tenderness what it had gained in scope? Carlos' friend should be less entitled to our tears and our admiration since he combines the most limited expression of well-meaning affection with its further expansion and since he softened the divine character of universal love in its human application? In the ninth scene of Act Three, this character's scope is widened to entirely new possibilities. At last, his passion for the Queen has led the Prince close to his doom. Evidence of his guilt is in the hands of his father, and his rash heat exposed his passion to the eyes of his lurking enemy; he is in imminent danger of falling prey to his insane love, to his father's jealousy, to the hatred of a priest, to the craving for revenge of a slighted enemy, and to a scorned woman. His outward situation requires urgent help, even more so his mental state which is about to put asunder all of the Marquis' plans and aspirations. The Prince has to be freed from this danger, he has to be torn out of his present mental state if those plans for the liberation of Flanders are still to be carried out, and it is the Marquis whom we expect to accomplish both and who, himself, gives us reasons to hope for that outcome. Yet, on this very path from which danger is coming the Prince's way, in the King, too, has been evoked an emotional state that lets him feel the need to share his feelings, for the first time. The torments of jealousy have transported him out of the unnatural restraints of his Royal status back into an original human state, have let him feel the emptiness and artificiality of his despotic greatness and have allowed desires to surface in him that neither power nor royalty can satisfy. gives me -- glowing gold --"
Precisely a course of events such as the one heretofore (played out before the reader and the audience), it appears to me, was liable to put a monarch such as Phillip II was, into such a state: and precisely such a state had to be created in him, in which the poet needs them (both Carlos and his father). By quite different means, both were caused to gravitate towards the Marquis de Posa, in whom the heretofore divided interests run together now. Through Carlos' passion for the Queen and the inevitable reaction it would provoke in the King, the Marquis' central position has been shaped: to this end it was necessary that the play was opened with it. Against it, the Marquis himself had to step back and had to be satisfied with a subordinate role until such time at which he could hold all the threads of the action, since from it he receives all the material for his future actions. The audience's attention was not to be distracted from Carlos' passion prematurely and therefore it was necessary that it provided the main topic until that time; the interest or cause, however, that was to subsequently become the predominant topic, could only be hinted at here and there. However, as soon as a building is erected, the scaffolding can be taken down. The story of Carlos' love as the introductory topic fades into the background to make room for that which it had prepared the stage for. What it had set the stage for were the hidden motives of the Marquis which are none other than the liberation of Flanders and the future of that nation, motives that one could only guess at under the cover of his friendship (for Carlos). Now they emerge, become apparent and are beginning to captivate all our attention. Carlos, as already clearly explained here, was merely looked at by him as the single indispensable tool for this purpose which he pursued fervently and, as such, embraced with the same enthusiasm as that purpose. Inevitably, the Marquis' anxiety over the well-being of his friend, yes, even his tender care for the tool of his universal love had to flow from this higher motive, as much as the strongest personal sympathy could have brought this forth. Karl's friendship affords him the most perfect enjoyment of his ideals. It (this friendship) is the culmination of all of his desires and activities. He does not yet know another and shorter path to the realization of his lofty goals of freedom and human happiness than that which has opened itself up to him in Carlos. He did not even try to search elsewhere for such a path, in the least would he have thought of directly taking this path through the King. Hence, when he is summoned by the King and taken to him, he espresses his utter indifference about that. nothing, indeed! To summon me to these rooms! nothing will come of this!" However, he does not give way to this idle expression of his childish amazement for too long. A mind such as his that is used to noticing the usefulness of each circumstance, who can also form coincidence into purposeful action, who can evaluate every event as it relates to his favorite cause, does not fail to recognize the opportunity that presents itself to him in this moment. Even the smallest increment of time is a valued treasure to him that has to be used to its fullest advantage. He does not yet have a fully developed plan with respect to this, only vague notions, and barely even that, it is up to this point only a hunch as to whether this opportunity might be of some use. He is to confront the man in whose hands lies the fate of millions. One has to seize the opportunity, he says to himself, an opportunity that presents itself only once. Even if he was only able to ignite one tiny spark of truth in the soul of this man who had never heard the truth. Who knows how prudence will work in him? He does not think of this opportunity as more than what it presents itself to him as and of using it in that way. In this frame of mind, he is waiting for the King. I shall reserve for some other opportunity my discussion of the tone or tenor with which Posa had opened the dialogue with the King from the beginning and how it was basically received by the King, so that I may explain this to you in more detail should you wish to hear me on that. For now, I shall limit myself to remaining with the discussion of that which is most closely connected to the Marquis' character. Everything that the Marquis, in his thinking, could reasonably expect to present to the King and the reaction to it that was to reasonably be expected was a certain amazement, connected with a degree of humiliation regarding the fact that his own high opinion of himself and his low opinion of human beings should at least suffer some exceptions: thus the inevitable embarrassment of a small mind confronted with a great mind. The effect of this might prove beneficial if it could only serve to shatter the preconceived notions of this man for one moment, if only this effect could make him feel that there existed cause and effect beyond his own realm of perception, of which he would not have dreamed. This single effect might reverberate in him for a long time and it might remain with him the longer the more it was without precedent. Posa, however, had judged the King's character too flatly, too superficially, or, if he had known him, he was not informed of his frame of mind in order to consider it, as well. This frame of mind was very advantageous to him and prepared a fertile soil for his speech that he could not reasonably have expected. This unexpected discovery gives his speech a lively fire, and to the drama it provides a completely new turn of events. Encouraged by his success that far surpassed his expectations, and inspired by some traces of humanity that surprise him in the King, he gets carried away for a moment to imagine that he can tie his ruling idea of Flanders' happiness, etc., directly to the King and to realize it directly through him. This prospect evokes a sense of passion in him that opens up his soul and reveals its deep motivations, all brain children of his imaginations, and brings to light all results of his deep thinking and renders clearly recognizable to what degree he is ruled by these ideals. Now, in his passionate state, all those motivations can be recognized that have, so far, set him in motion; at this point, he reacts like every enthusiast who becomes inspired by his ruling idea. He does not know any limitations; in the fire of his enthusiasm, he ennobles the King in his own mind; the King listens to him in astonishment and Posa forgets himself enough to set his hopes in him, about which he will blush in the first few quiet moments of reflection. He does not think of Carlos, anymore. What a detour to wait for him! The King offers him a closer and quicker solution. Why delay the arrival of mankind's happiness until his heir is ready? Would Carlos' bosom friend forget himself so far, would any other passion (than that by which the Marquis was ruled) have carried him away that much? Is the interest of friendship so mobile that it can be transferred this easily to a new object? Everything can be explained, however, as soon as the friendship is subordinated to the ruling passion. Then it is natural that it claims its rights at the next opportunity and that it does not ponder very long in exchanging its means and tools. The firmness and the frankness with which Posa presented his ruling ideas to the King and which had up to this time been secrets between Carlos and himself, and the illusion that the latter might understand or even fulfill them, was an obvious act of unfaithfulness against Carlos of which he becomes guilty. Posa, the citizen of the world, was allowed to act this way, and him alone can be forgiven for it. In Carlos' bosom friend it would be as condemnable as it would be without any basis for understanding. Naturally, this misconception does not last longer than a few moments (in Posa). He can easily be forgiven for his first reaction of surprise; were he to continue to believe in it after sober reflection, however, he would rightfully sink in our estimation to the level of a mere dreamer. That this momentary perception had taken hold of him, becomes clear in a few passages in which he jests about it or cleanses himself of it: "Imagine", he says to the Queen, "I would consider putting my faith in the Throne? something that could not be carried out. that would be the question, I think." from me, in vain. You have realized that. become his angel, there is no hope left for me. dear to him as his own soul.. O, I know that! Thousands of times it has been proven to me. fatherland be dearer to him than one man? and Carlos' happiness too small for his love. He sacrificed me to his virtue." TO THE NEXT SIX LETTERS!